I don't usually do food on Bromeliad, but this thing was so pretty it sort of qualifies as home decor. This recipe comes from House Beautiful and is probably my first ever made-straight-from-a-magazine recipe, especially from a hoity toity one like HB. I made a few modifications from Alex Hitz's recipe to bring it down to the level of mere mortals. 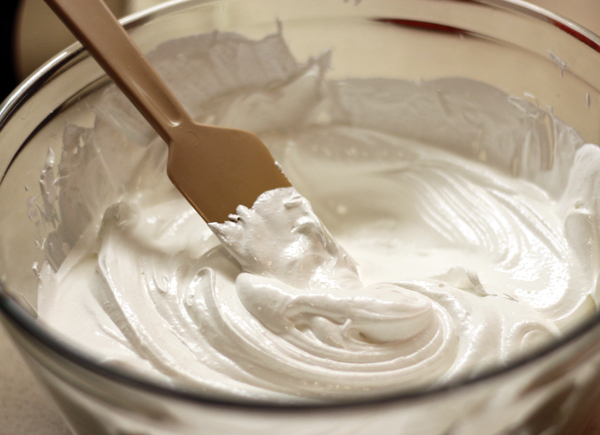 Whip the meringue until it's the consistency of marshmallow fluff. 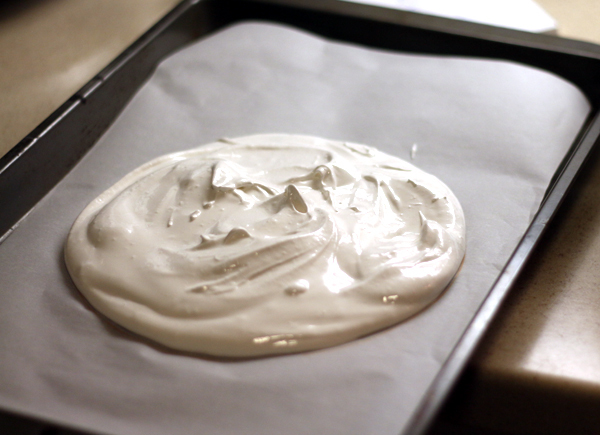 Use a spatula to create three meringue patties. Keep the thickness as uniform as possible. From Alex: Lower the oven to 200 degrees, and bake the meringues for 1½ hours. Turn the oven off, but leave the meringues in the oven overnight. Do not open the oven door until the next morning. From me: This totally worked. The recipe next calls for making stewed fruit. To be honest, the whole thing was so sweet, I don't think you need to stew the fruit. Also, having extra fruit to cut the sweetness would be nice. 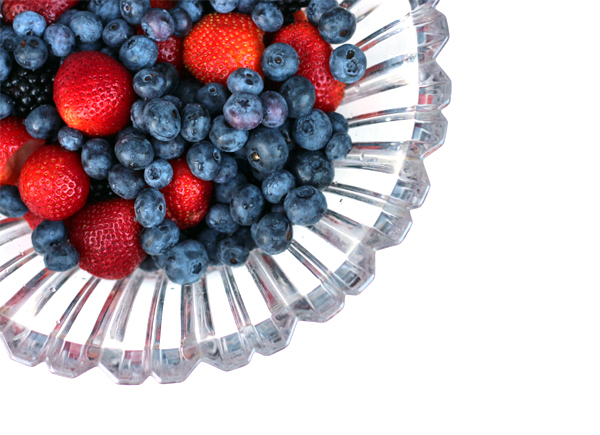 So, I would say you need five or six cups of fresh berries like strawberries, blueberries, raspberries, and blackberries. Slice most of the strawberries. Leave a few whole for the top of the pavlova. The last step is making whipped cream. Alex's recipe calls for 1 cup of heavy cream, 2 tablespoons sugar and 1 tablespoon good bourbon. I had no bourbon so can't comment on that but definitely double the whipped cream. You need the mortar to hold this thing together. Plus, when can you ever have too much whipped cream? Tip: Put your bowl and beaters in the freezer for 10 minutes before making the whipped cream. 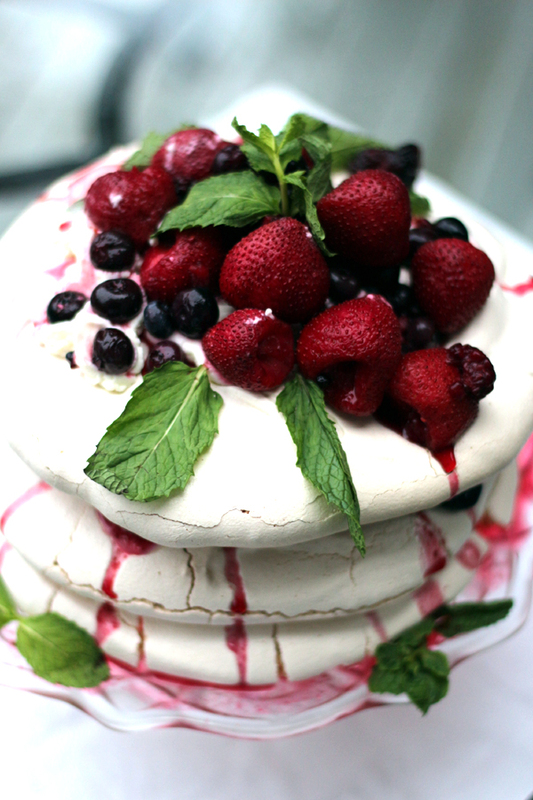 Assemble with a layer of meringue, a layer of whipped cream and a layer of fruit. Embellish with fresh mint. There you go. 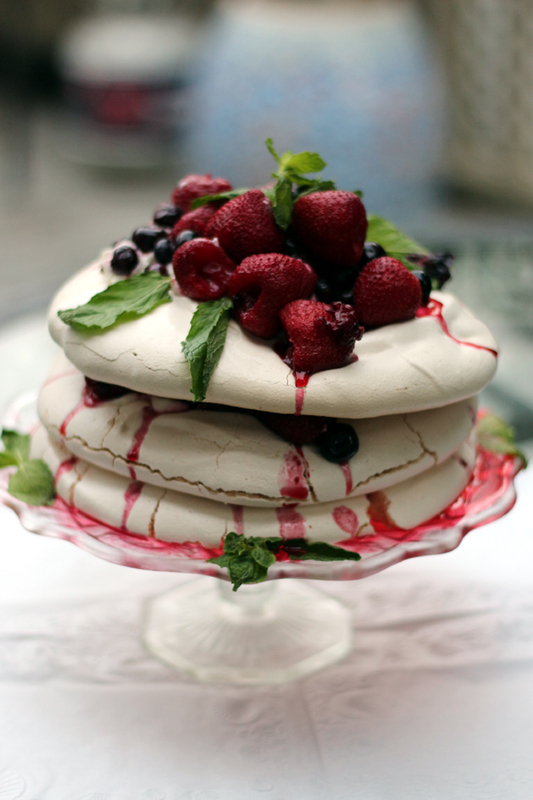 If any Aussies tell you this is not a real pavlova, you can inform them they did not invent the pavlova; kiwis did. This will quiet them for 30 seconds. You can make the meringues up to three days ahead. Everything else should be assembled just before eating. It's gluten free and an absolute sugar bomb. This looks so good and easy, I think I could do it. This is stunning! I've never made Pavlova but I'm going to add to my to bake list. my Gosh, this looks incredible! I could eat those meringues plain, not to mention in this delicious combo! I have to try this before I die!